This report presents, verbatim, the United States “Flag Code” as found in Title 4 of the United States Code and the section of Title 36 which designates the Star- Spangled Banner as the national anthem and provides instructions on how to display the flag during its rendition. 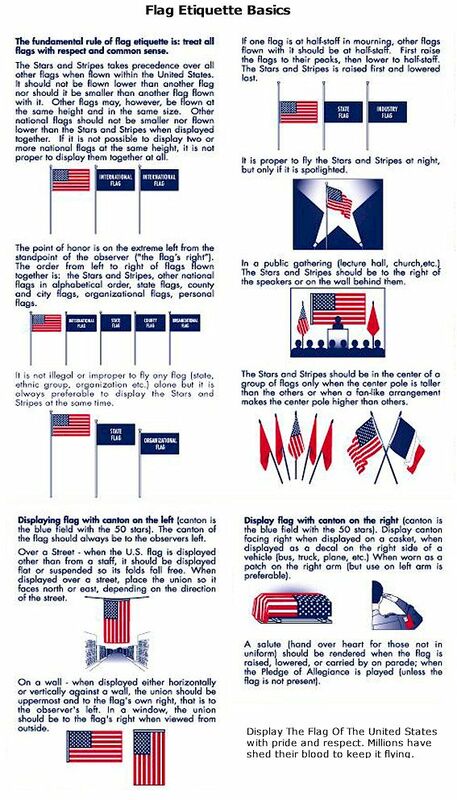 The “Flag Code” includes instruction and rules on such topics as the pledge of allegiance, display and use of the flag by civilians, time and occasions for display, position and manner of display, and how to show respect for the flag. The “Code” also grants to the President the authority to modify the rules governing the flag. The report also addresses several of the frequently asked questions concerning the flag. The subject matter of these questions includes the pledge of allegiance and the court decisions concerning it, the nature of the codifications of customs concerning the flag in the “Flag Code,” display of the flag 24 hours a day, flying the flag in bad weather, flying the flag at half-staff, ornaments on the flag, destruction of worn flags, display of the U.S. flag with flags of other nations or of States, commercial use of the flag, size and proportion of the flag, and restrictions upon display of the flag by real estate associations. enacted legislation on this subject. The Federal Flag Code does not purport to cover all possible situations. authority to issue “official” rulings legally binding on civilians or civilian groups. specifically included in the Code may be deemed acceptable as long as proper respect is shown. attention facing the flag with the right hand over the heart. When not in uniform men should remove any non-religious headdress with their right hand and hold it at the left shoulder, the hand being over the heart14. Persons in uniform should remain silent, face the flag, and render the military salute. Order 10834 issued pursuant thereto. illuminated during the hours of darkness. when an all-weather flag is displayed. of admission); and on State holidays. (f) The flag should be displayed in or near every polling place on election days. (g) The flag should be displayed during school days in or near every schoolhouse. flags, in front of the center of that line. as provided in subsection (i) of this section. should be fixed firmly to the chassis or clamped to the right fender. and its staff should be in front of the staff of the other flag. pennants of societies are grouped and displayed from staffs. of another nation in time of peace. out, union first, from the building. a north and south street. position of honor at the clergyman’s or speaker’s right as he faces the audience. grave or allowed to touch the ground. more than two directions, the union should be to the east. organization or institutional flags are to be dipped as a mark of honor. as to permit it to be easily torn, soiled, or damaged in any way. lapel flag pin being a replica, should be worn on the left lapel near the heart. any such alteration or additional rule shall be set forth in a proclamation. the Star-Spangled Banner is the national anthem. anthem and maintain that position until the last note. and act in the same manner they would if the flag were displayed. Corps Iwo Jima Memorial, Arlington, Virginia;26 Lexington, Massachusetts;27 the White House;28 the Washington Monument;29 United States Customs ports of entry;30 and Valley Forge State Park, Pennsylvania.31 The reports that accompanied these official acts indicate that the specific authority was intended only as a form of tribute to certain historic sites rather than as exceptions to the general rule of the Code. preserved by lighting that prevents its being enveloped in darkness. day, the flag should be lowered during brief periods of precipitation. own flag or that make such display alone a form of desecration. type finial used is a matter of preference of the individual or organization. and no Act of Congress or Executive Order either requires or prohibits the practice. an equal level with that of the flag of the U.S. is not clear from the face of the statute. status of these statutes and cases can not be taken for granted in light of Eichman and Johnson. flags authorized for federal executive agencies can be found in Executive Order No. residential property to which the member has a separate ownership interest. 1 4 U.S.C. §§ 4-10. 2 36 U.S.C. § 301. 3 4 U.S.C. § 5. 4 4 U.S.C. § 10. 5 4 U.S.C. § 8. 6 18 U.S.C. § 700.
v. Johnson: Flag Desecration and the First Amendment. 8 P.L. 101-131, the Flag Protection Act of 1989, amending 18 U.S.C. § 700. Summary of Recent Supreme Court Decisions and Proposed Constitutional Amendment. 10 P.L. 623, 77th Cong., 56 Stat. 377. 11 P.L. 829, 77th Cong., 56 Stat. 1074. 13 P.L. 105-225, § 300111.
salute. See, 4 U.S.C. § 9 as amended by P.L. 110-181, § 594. 15 Martin Luther King Jr.’s birthday was added by P.L. 106-80, 113 Stat. 1285. 16 P.L. 396, 83rd Cong., 68 Stat. 249. 17 See, West Virginia Board of Education v. Barnett, 319 U.S. 624 (1943). 19 Newdow v. U.S. Congress, 328 F.3rd 746 (9th Cir. 2003). 20 Elk Grove Unified School District v. Newdow, 542 U.S.1 (2004). 21 Now codified at 4 U.S.C. § 7. 265 F. Supp. 308 (D. Del. 1967); see also N.A.A.C.P. v. Hunt, 891 F.2d 1555 (11th Cir. 23 4 U.S.C. § 6(a). 24 Proclamation No. 2795, July 2, 1948, 62 Stat. 1526. 25 P.L. 319, 83rd Cong., 68 Stat. 35. 26 Proclamation No. 3418, June 12, 1961, 75 Stat. 1068. 27 P.L. 89-355,, 79 Stat. 1294. 28 Proclamation No. 4000, Sept. 4, 1970, 84 Stat. 2243. 29 Proclamation No. 4064, July 10, 1971, 85 Stat. 916. 30 Proclamation No. 4131, May 9, 1972, 86 Stat. 1633. 31 P.L. 94-53, 89 Stat. 259. 32 4 U.S.C. § 6(c). 33 4 U.S.C. § 7(m). in honor of members of the Armed Forces from their jurisdiction. 36 34 Op. Atty. Gen. 483. 37 4 U.S.C. § 8(k). 39 See, United States v. Eichman, 496 U.S. 310 (1990). 40 4 U.S.C. § 7(c). 41 4 U.S.C. § 7(g). 42 P.L. 623, § 3(g), 77th Cong., 56 Stat. 377, 378. 43 P.L. 107, 83rd Cong., 67 Stat. 142. 44 S. Rept No. 258, 83rd Cong., 1st Sess. (1953). 540 F.2d 1083 (5th Cir. 1976). 46 4 U.S.C. § 7(e). 47 4 U.S.C. § 7(f). 48 4 U.S.C. § 8(i) & (j). 49 P.L. 94-344, § 1(16). 50 4 U.S.C. § 8(i). 52 See, e.g., Halter v. Nebraska, 205 U.S. 34 (1907). 53 4 U.S.C. § 3. 54 See, e.g., Central Hudson Gas and Electric Co. V. PSC, 447 U.S. 557 (1980). 55 Aug. 21, 1959, 29 F.R. 6865; see 4 U.S.C. §§ 1-2.